This is one of the most common questions that lands in my inbox on a weekly basis, and it’s no secret that the majority of lifters out there place chest training at the very top of their list of muscle building priorities at the gym. 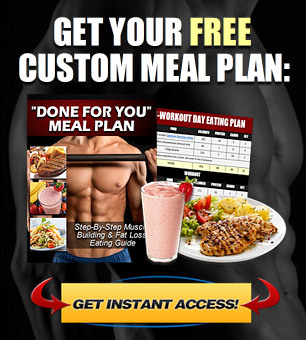 In this post I’m going to outline a highly effective sequence of 3 individual chest exercises that I personally recommend to maximize your overall gains in pec mass and thickness. Rather than blindly telling you to “do these exercises for this many sets and reps”, I’m also going to give concrete reasons for why each exercise has been selected and why I recommend performing it in place of other possible alternatives. These lifts should be executed in the exact order that they’re listed and will give you a complete, well-rounded pec workout for consistent size and strength increases. Do keep in mind that there are a million and one ways that you could effectively train your chest, and I’m not claiming that this is the be-all-end-all by any means. Any set of exercises that allows you to place the pecs under tension and consistently add weight over time will result in significant gains in muscle size and strength. In my view, these are the two very best chest exercises to select from as they utilize the best chest training tool available (dumbbells) at the optimal angle (flat/decline) to maximize pec hypertrophy. 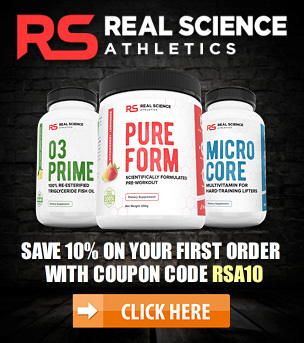 Either variation is fine, and I simply recommend selecting the one that you most prefer and that you use it as the primary exercise in your chest training routine. First off, why a dumbbell press rather than a barbell press? 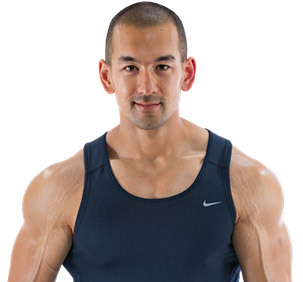 * The primary function of the pecs is horizontal adduction of the humerus (bringing your upper arm across the front of your body), and dumbbell presses offer a superior range of motion through this function since the hands and arms can be brought together rather than being locked onto a fixed bar. * Dumbbell presses force each arm to move independently, which prevents strength imbalances and ensures consistent development across the entire chest. * Dumbbell presses reduce the chance of shoulder injuries since you can position your hands more comfortably and press your hands in a more natural arching motion. Secondly, why the flat/decline angle? 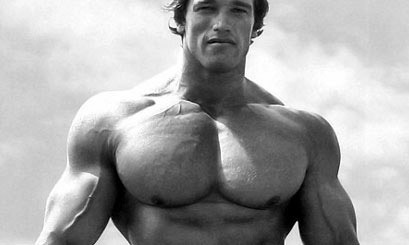 The pec muscle is comprised of two main portions: the upper clavicular fibers (otherwise referred to as the “upper chest”) and the lower sternocostal fibers. While some upper chest training is definitely important (we’ll cover this in the second exercise), it’s actually the lower fibers that make up the vast majority of the pec muscle. For that reason, you’ll want to specifically target these fibers when your strength and energy are at their peak, and a flat or decline angle places your body into the proper position for this. 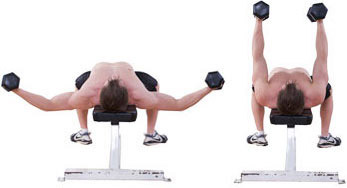 To start off your pec workout, perform 3-4 sets of flat or decline dumbbell presses for 5 to 7 reps per set. 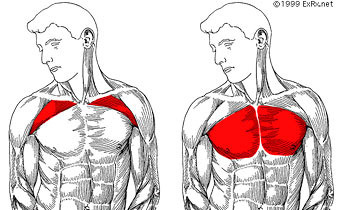 As I just mentioned, targeting the upper clavicular fibers is still important for complete chest development from top to bottom, and an incline dumbbell press is the best way to accomplish this. You’ll be using dumbbells here for the same reasons we just talked about, and you’ll be using the 30 degree incline since this properly angles your body for direct stimulation of the upper chest. Perform 3-4 sets of incline dumbbell presses for 5 to 7 reps per set. 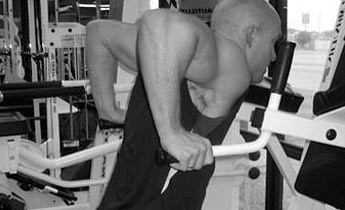 To finish off your pec workout you’ll be performing a cable flye utilizing a high to low angle. Flyes isolate your pecs at a slightly different angle than presses and are a great way to round out your chest routine for complete pec development. There are a ton of different flye exercises you can choose from, such as dumbbell flyes, cable flyes and machine flyes, but as I discussed in my previous post (The Best Chest Fly Exercise), cable flyes are definitely the superior choice. First off, why use cables rather than dumbbells? Simple: because of the direction that gravity is pulling the weights (straight up and down) and the path that the weights are traveling in, dumbbells only provide a high degree of tension on the pecs in the bottom half of the range of motion. As you press the weights up past halfway the tension gradually decreases on the pecs, and at the very top of the movement there is very little to no stress on these muscles at all. Cable flyes solve this by pulling the resistance out to the sides rather than straight up and down. As a result, you’ll be placing your pecs under significant tension both at the very bottom of the movement all the way into the fully contracted position. Secondly, why the high-to-low angle? Setting the cables high up on the stand and pressing them downward places the resistance in line with the lower sternocostal fibers where the bulk of your chest mass is located. And since the upper chest makes up such a small portion of your overall pecs, there’s no need to directly train it any further using a flye movement if you’re already performing an incline press as part of the workout. To finish off your pec workout, perform 3-4 sets of cable flyes at a high to low angle for 8 to 10 reps.
There’s nothing wrong with a barbell press, and it certainly is an effective chest exercise for building size and strength. Contrary to traditional bodybuilding advice, if you examine the exact mechanics behind a wide-grip dip you’ll see that it actually isn’t a great movement for maximizing chest gains. 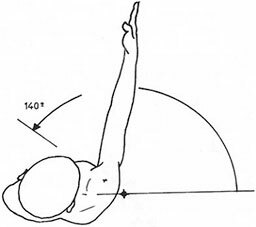 Dips primarily involve flexion of the shoulder and extension of the elbow (rather than adduction of the humerus), meaning that they mostly hit the front of the shoulders and the triceps rather than the pecs. They also place the shoulder joint into an awkward position and are easily the most dangerous pressing exercise you can perform at the gym. Again, dips certainly will allow you to build your chest, and performing them doesn’t automatically mean you’ll get injured, but all things considered, the risk-reward just isn’t worth it, especially when you already have superior chest exercises in your arsenal anyway. There are no are exercises specifically for this purpose because it’s simply not possible to target the inner or the outer chest over any other portion of the muscle. You can target the upper or lower chest because you’re dealing with two different sets of fibers, but you can’t target the inner or outer because when one portion of the same set of fibers fire, the entire set of fibers will fire with it. 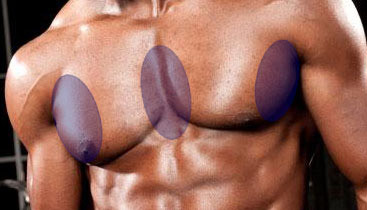 Again, there are an endless number of different ways you could train your pecs for mass gains, but this is particular routine utilizes the most effective chest training tools available and at the proper angles to allow for effective, balanced stimulation of the chest, and in a safe and sustainable way.